Getting bored of rock climbing limestone? Bored of climbing vertical and overhanging wall? Try this place, we have visited the place in 2009 and the bolts seems new on every routes with approximately 20 sport climbing routes together with some 2-3pitches routes. Let’s forget about big deep jugs hold, under-cling, side-pull, stalactite and slopper. You will only find Mr.Crimpy and Ms.Pocket all over the wall and they will tell you how good is your balancing on the rock, and there are plenty of boulders at the beach for bouldering enthusiasts. 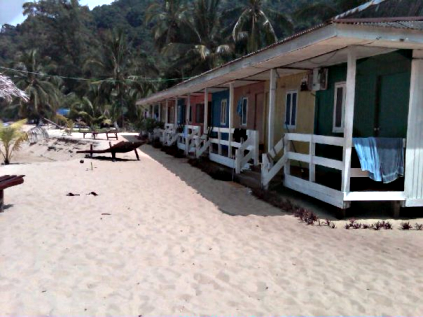 Tioman is off the south-east coast of peninsular Malaysia, just north of the Johor-Pahang state borders. It is reachable by speedboat or ferry from the coastal town of Mersing. Alternatively, you may choose to take flights to Mersing at Senai airport in Johor Bahru and Changi airport in Singapore. You will need to stay at Nipah and the slab climbing wall just at south-east 5 to 10mins away from the guest house by speedboat. Ask the people at Nipah and they will bring you to the beach where the slab wall located, once arrived at the said beach, you will be able to see the slab wall up the jungle hill, look for the jungle trail and hiking is required for around 15mins to the climbing site. The climbing here is very difficult to access now as almost all of the huts have been washed away in the monsoons and there is no accommodation there now. Only ~3 huts remain. 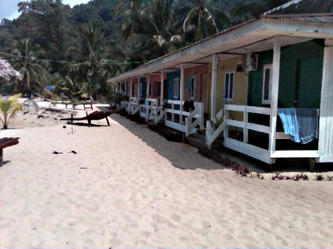 As of May 2013, about 20 new huts are being built but otherwise only access is by sea taxi from Genting which is very expensive (about 200myr+ return trip and you need to arrange a pickup which will cost more) , and then it would be best to camp.